Have you ever noticed how kids simply flourish when there’s water around? Be it an ocean beach, a Great Lake, a small pond, a pool, a hose, or a sprinkler, water means fun. Take the crankiest child and get him in the water, and you’ve got a happy camper on your hands almost immediately. 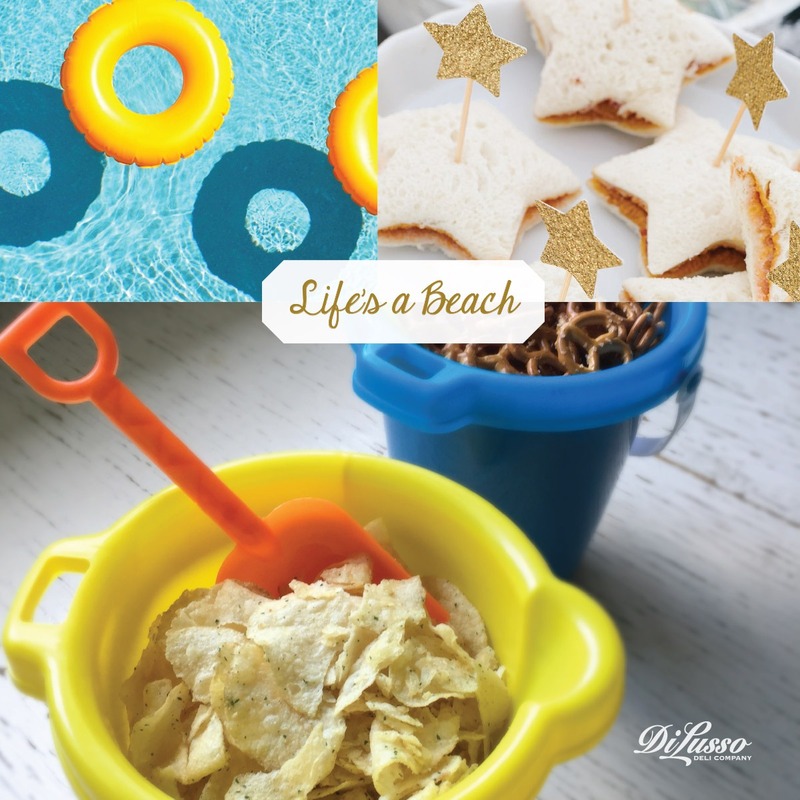 Capitalize on this phenomenon by hosting a fun-filled beach party for the kids. Don’t worry if you’re landlocked: a store-bought kids’ pool or even a lawn sprinkler can provide the watery fun factor. Of course if you can pack up the party—and guests—and head for the beach, so much the better. And if you’re one of the lucky few to have a backyard pool, you’re set, with no driving necessary! Every party needs food—especially a party attended by active children. As always, we have some ideas that are sure to make a splash. Split croissant rolls in half horizontally and fill with a variety of DI LUSSO® meats and cheeses to make sandwiches. 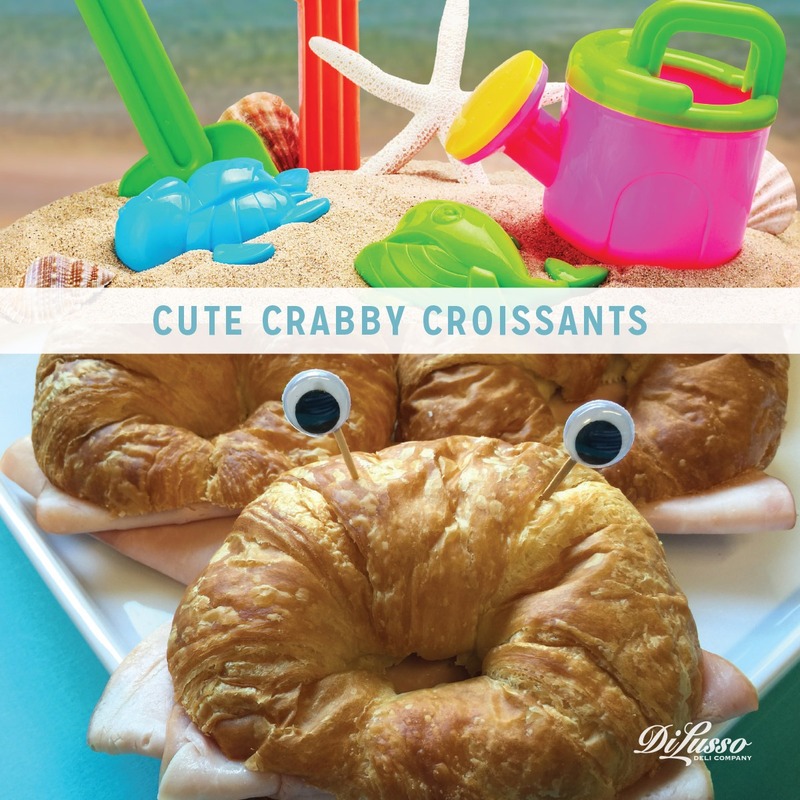 Add some googly eyes (purchased at a craft store and glued onto toothpicks) and voila—instant “crab” sandwiches! So adorable. Alternatively, assemble sandwiches on white bread and carefully cut out into flip-flop shapes. Decorate as desired. Or use a star-shaped cookie cutter to make starfish sandwiches. For snacks, fill plastic beach buckets with dry snacks such as pretzels and, of course, fish-shaped crackers. Make a big jug of “ocean water” by adding a few drops of blue food coloring to plain H2O. Cookies or donuts could be your sweet treat, representing, of course, swim rings. Or glue colorful paper triangles onto toothpicks and insert into the tops of cupcakes to resemble sailboats. Add to the water fun with plenty of blow-up beach balls, water balloons, and squirt guns. You could also fill a small, hard plastic kids’ wading pool with clean play sand. Bury small party favors in the sand, and have the kids dig with sand shovels to find their buried treasure. You’ll certainly want to keep an eagle eye on the kids to make sure everyone stays safe (if at a beach or pool, make sure there’s a lifeguard present). Sunscreen and nice dry towels are a must, as well. Sandy beach, backyard pool, or garden hose—water play will keep kids happy and cool on a hot summer day. And they’ll surely sleep well that night. So dive in!